This car had a tin of varnish thrown over it, it was a special kind of concrete sealant which was fairly difficult to remove. I can hardly say that this job was typical, as we have never had to remove a substance anything quite like this from a car, but we do get to see tins of all sorts of stuff poured in or on cars, either accidentally or deliberately. 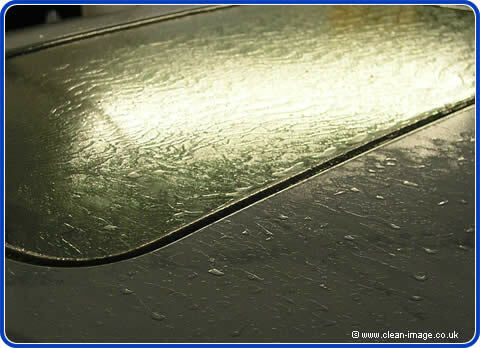 It had been raining when the vandalism occurred - this meant that the owner of the car hadn't noticed the extent of the damage until it had already dried, but on the bright side, this also meant that the varnish/sealant hadn't bonded to the paintwork as well as it might have. It took Gary two hours of pressure washing, pulling and picking to get the varnish off. Some parts came off fairly easily once the pressure washer got underneath it (all though the varnish pulled the pinstripe off which we replaced) but around recesses and shuts the varnish had stuck fast. After two hours we had removed 99% of the varnish, at which point the customer told us to stop, having decided that he would pick out the final bits himself - this isn't a bad idea as it would take quite a long time and so having us get the worst off he could do it at his own pace and save some money. 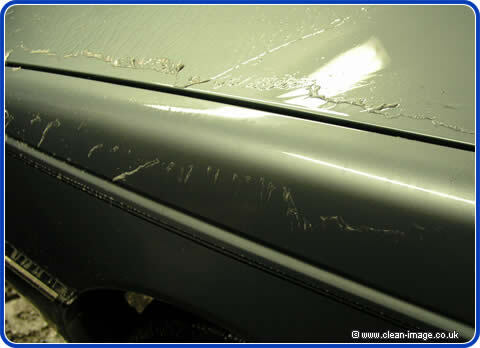 However, we think that had the customer got the car to us sooner before the varnish had dried, we probably could have removed all of it within the two hours. Any kind of paint or varnish is always easier to remove when it's still wet, no matter if it is inside or out. (See our other articles on spillage and vandalism on interiors). So the moral of the story is to try and get to us as soon as possible if this kind of thing happens to your car. 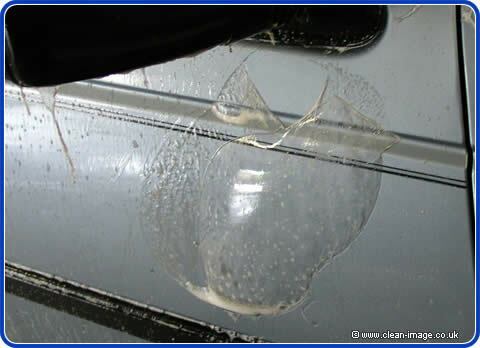 If you are too far away to travel to Clean Image, then at least give us a call before trying to do anything yourself - trying to tackle spillages in the wrong way can often make matters worse or cause permanent damage, so please call on us for advice. The whole job cost £66.88. [prices] For larger jobs such as flood damage, and extensive vandalism, where we need to dismantle parts of the car and keep it for several days, we are happy to quote a fixed price. "When I arrived covered in 'Goo' I thought I would set an appointment. You actually went into action immediately and the car, which is kept in immaculate condition, was restored. I cannot thank you enough for your kind help, without you I would have written off the car, the 'goo' was so bad. Again thank you so much for all your efforts and of course your expertise in all of this.